Revenue in the Functional Wear segment amounts to US$68,939m in 2019. The market is expected to grow annually by 3.8% (CAGR 2019-2023). In global comparison, most revenue is generated in United States (US$43,459m in 2019). In relation to total population figures, per person revenues of US$9.37 are generated in 2019. Functional Wear here refers to clothing, mainly for sports but also other purposes, that has been specially designed to provide on the one hand protection against physical injury, heat or cold, water or wind, and on the other hand assist athletes in physical activities by adding breathability and moisture transfer. In addition, Functional Wear here also includes shaping garments designed to improve the wearer’s appearance. Examples include cycling jerseys, yoga pants or running gear. 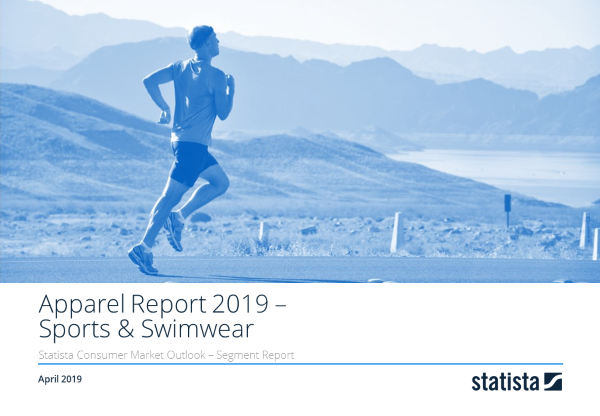 There is no overlap with the other Apparel segments shown in the Consumer Market’s Apparel market. Articles in the regular womens’ or mens’ clothing sections or in Track & Jogging Suits or Swimwear can have functional properties as well. Here, only articles that are primarily functional in the mentioned ways are included. Functional Work Wear for B2B/bulk customers is generally not included. The volume data has been converted from kilograms to units in some countries using a typical unit size of 280 grams (upper and lower body of typical running gear). Reading Support Revenue in the Functional Wear segment amounts to US$68,939m in 2019. Reading Support The Functional Wear segment is expected to show a revenue growth of 4.0% in 2020. Reading Support The average revenue per person in the market for Functional Wear amounts to US$9.37 in 2019. Reading Support In the market for Functional Wear, volume is expected to amount to 2,411.94 m pcs. by 2023. Reading Support The market for Functional Wear is expected to show a volume growth of 2.6% in 2020. Reading Support The average volume per person in the market for Functional Wear amounts to 0.3 pieces in 2019. Reading Support The average price per unit in the market for Functional Wear amounts to US$31.55 in 2019. Reading Support With a market volume of US$43,459m in 2019, most revenue is generated in United States. Here you can find more studies and statistics about "Functional Wear".